The children took the opportunity of being active after school, keeping hydrated and having fun with Just Play. 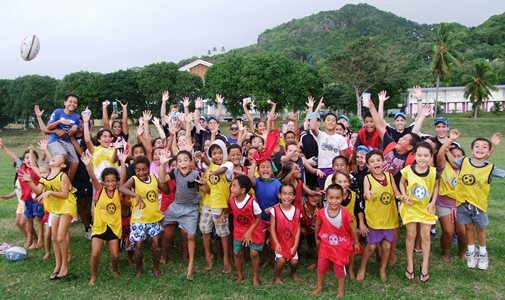 Cook Islands Football through its Just Play program united with three sporting organizations, the Ministry of Health and 13 visiting coaches from Holmesglen Institute to put on this month’s Village Festival for youngsters aged 5 to 13. “This was a great opportunity for the Just Play’s Village Festival to have additional support from the visiting coaches who are here for the first time conducting their practicum” says Project Manager Michelle Paiti. “They are all experienced coaches majoring in sports development whose goals are coaching for a sporting future” Paiti continues. The multinational coaches are not only from Australia but also Brazil this year’s host for the FIFA Men’s World Cup Football kicking off on June 12th and a Cook Islander from the Taripo family. The children received basic skills and learned some of the main points of each activity, which aimed to promote participation, physical activity, keeping hydrated with water while educating them on the important health messages to improve their lifestyle and healthy living. Just Play project manager Michelle Paiti was delighted with the support from the parents and children who were ready to come out and play in a fun, safe, supervised community festival. The health message for the month is Hydration. Just Play Project Manager, Michelle Paiti and Public Health’s Karen Tairea are encouraging our young children to drink more water. Karen Tairea enforced the importance of the health message that water is best for their bodies and brain during an extended water break while also showing the children the amount of sugar in other drinks. Children enjoyed the activities that were filled with fun and thrilling games as smiles could be seen on many faces. The Village Festivals is a Just Play Community Initiative which provides all boys and girls between 5 and 13 years the opportunity to be physically active after school in their community by participating in a variety of different sporting activities and promoting the awareness of non-communicable diseases. Paiti would like to acknowledge the other sports codes; Cook Islands Rugby, Cricket, Rugby League, the Ministry of Health and visiting Holmesglen Institute for partnering up to deliver this monthly event with health awareness and better lifestyles for our youngsters. Paiti would like to acknowledge the continued support of Australian Aid for their continued funding of the Just Play Social Development Programme.